Carmicheal Rail AECOM Large scale geotechnical investigation using 3 specialised rigs. Dam Investigation SunWater Vertical and Incline core holes through the spillway. Cruise Ship Terminal Golder Associates Overwater geotechnical investigation on a floating barge. Logan Enhancement Project Soil Surveys Geotechnical investigation for Logan Motorway upgrade. Spirit Development Butler Partners Deep geotechnical investigation to 65mtr for new high rise foundation. Dam Investigations SunWater Geotechnical investigation for dam stability reveiws including drilling through live embakments. Citiswitch Bundamba Douglas Partners Mining Investigation. Rotary Air and cored holes to maximum 60mtr through multiple workings. Nightcap Range Golder Associates Inclined NQ and NMLC core holes to maximum 60mtr. Kingford Smith Drive Upgrade Golder Associates Overwater Investigation using floating spudled barge. Washbore and cored boreholesto 30mtr. With pressure meter testing. Toowoomba Second Range Crossing Aurecon / Parson Brinckerhoff Large scale geotechnical drilling including: NMLC/HQ/PQ coring, incline drilling, down hole survey. Very difficult access condtions. New Hope Group/New Acland Mine Golder Associates Standard geotechnical investigation including auger/washbore and cored holes to 30mtr. Shellow auger holes up to 8mtr. Golder Associates Geotechnical investigation - Auger, Washbore and NMLC to maximum 60mtr. 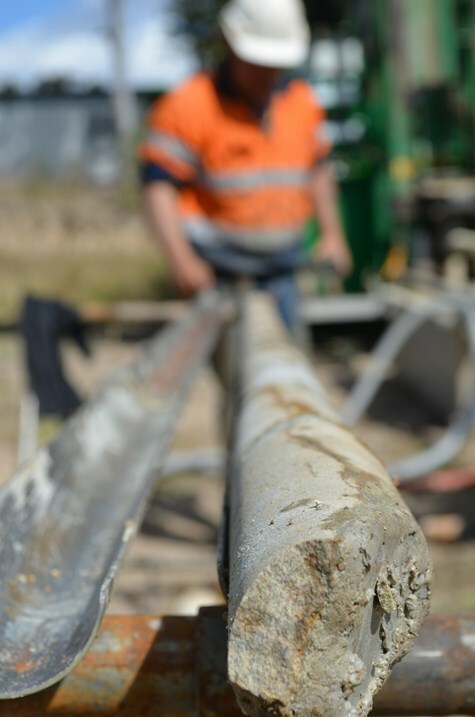 Arrow Energy - Moranbah Coffey Shallow washbore and coring. Arrow Energy - Dalby Golder Associates Shallow washbore and auger. D2G Geotechnical and mine investigation Dinmore to Goodna Origin Alliance Washbore and coring to 50mtr. Mine drilling - Rotary air, rotary mud and coring to 150mtr. Downhole geophysical and camera logging. Installation of groundwater wells, inclinometers and extensometers. Surat Basin Rail Surat Basin Rail JV Drilling including auger washbore and coring. Extensive test pitting and access creation through difficult terrain. Cross River Rail Brisbane Soil Surveys / Aecom Overwater and on land geotechnical drilling to 50mtr including packer permeability testing and ATV survey. QR corridor mine Investigation Douglas Partners Rotary air and HQ coring to 60mtr. Adani - Carmichael Mine Investigation 4DG + Coffey Geotechnics Washbore and coring to 65mtr. Swanbank Landfill Soil Surveys/AECOM Geotechnical and Mine Investigation to maximum 180mtr depth. Drilling through >50mtr fill and multiple level mine voids. Various Dam investigations Douglas Partners/ Origin Energy / Santos Auger drilling and installation of groundwater monitoring wells. Geotechnical Investigation Townsville to Tully Powerlink QLD / Roadtest Auger, washbore and coring plus installation of groundwater monitoring wells.